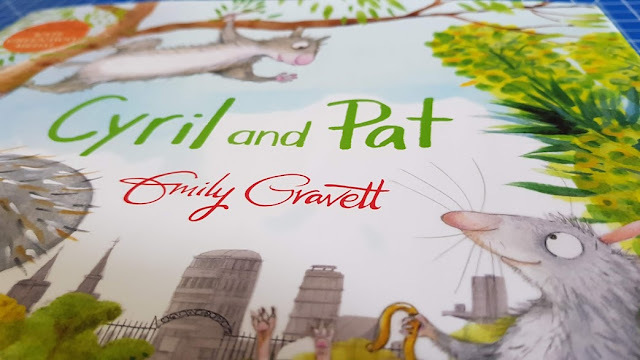 Cyril and Pat is maybe a little young for my family, but Emily Gravett's work is so beautiful and the story is such a fabulous message that sometimes an exception should be made. 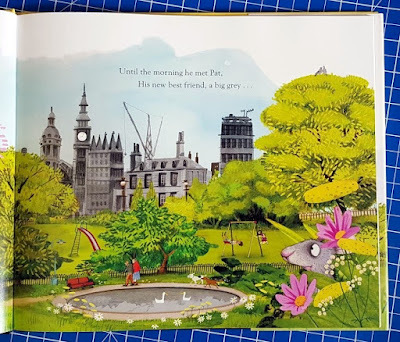 This large format hardback book is written in rhyme and very cleverly leads you to the final word of each page... and then surprises you by saying something completely different. I read together with my 8 and 9 year old boys - because reading together is still nice sometimes, even when you can read yourself. The story centres on Cyril the squirrel and his best friend Pat. The 2 small animals live in a park in the middle of a city. Cyril doesn't know that Pat is not a squirrel, and he doesn't care. Pat is his friend and that's what matters. Other characters try to 'warn' Cyril about Pat and talk meanly about him, without even knowing him. They stereotype and make assumptions, gossiping and not even giving Pat a chance. They tell Cyril he shouldn't be friends with Pat. Pat, feeling unwanted, leaves quietly. Cyril misses Pat, and then he gets into a dangerous position, but his friend is right there to rescue him. Cyril And Pat has a lot to say, which is often lacking in a young children's book. There are messages here that children, and their parents, will understand. The illustrations are beautiful, full of life and incredibly detailed. This is one of the most gorgeous books I've ever reviewed. You get a real feel for the massive locations, even though you are experiencing them from 30cm off the floor at squirrel height. Cyril and Pat is written and illustrated by Emily Gravett and published by TwoHootsBooks (Pan Macmillan). Available to buy now hardbacked, 32 pages, rrp £12.99 from all good bookshops instore and online, including Waterstones and Amazon. I am delighted to say that TwoHootsBooks have kindly offered 3 copies of this gorgeous book for my readers. I'm giving away a copy on Twitter with simple retweet entry, but I also have a giveaway here where 2 readers can win a copy each. Entry to the giveaway is by Gleam form below. If you are new to Gleam, you can take a look at this guide for help. 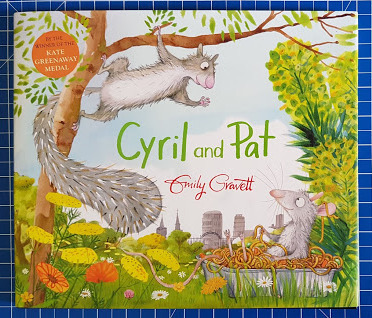 We were sent our copy of Cyril And Pat by Emily Gravett for review. Amazon links are affiliate, meaning I earn a few pence if you order through my link, but you don't pay any more. My four week old niece. A beautiful standard wisteria flowering for the second time this year. I work in a Children's Centre and I was sorting out donated clothes and found the most adorable Winnie the Pooh Babygro, I honestly haven't seen one so lovely before. I even took a picture to show my partner! The rain, after this long dry spell. In my opinion Cyril And Pat is a beautifully illustrated book. What have you seen recently that you thought was beautiful? . . . . . . sunrise over the Black Sea, stunning!! The hollyhocks in my garden, that i have grown from seed, all in full bloom. we have a bautiful illustration of Edinburgh that is on the kids bedroom wall - beautiful!! When I see my daughter in her cot in the morning, on her belly, smiling up at me! A white pen window display in Kirkby Lonsdale, stunning! a rainbow after weeks of no rain!! A butterfly on a sunflower. The view of the coast at Westwood Ho! 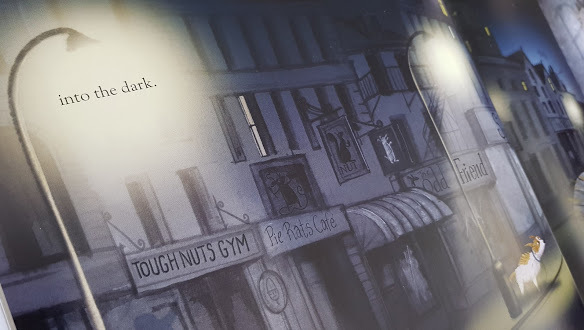 I love the illustrations in The Owl Who Was Afraid of the Dark. I have just come back from a week in London culminating with a visit to the National Gallery, where I saw many beautiful paintings, but the one that stood out to me as the most beautiful of all, is Monet's The Water Lily Pond.